LAHORE: As the opposition Pakistan Tehreek-i-Insaf is expecting a decision by the Supreme Court in the Panama Papers case next week, the ruling Pakistan Muslim League-Nawaz hawks have stopped the chorus of blaming elements in the military establishment and judiciary for hatching conspiracies to oust Prime Minister Nawaz Sharif. 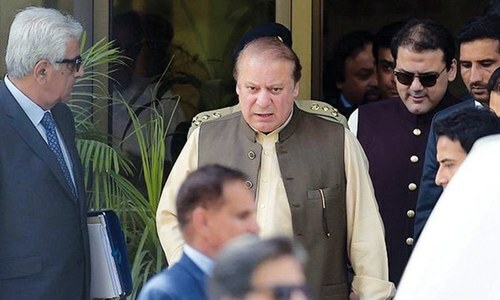 The PML-N leaders have now completely shifted their focus from the ‘establishment and judiciary’ to the Joint Investigation Team that probed the money laundering allegations against the Sharif family and submitted its report to the apex court. “Our message of conspiracy has already been conveyed to the people and our workers. Now we are only focusing on further discrediting the JIT and challenging its report in the court,” a senior PML-N leader from Punjab told Dawn on Thursday. 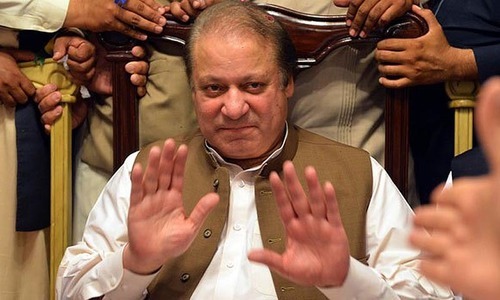 The PML-N leader gave two reasons for changing the focus — the Supreme Court’s notice of speeches by Railways Minister Khawaja Saad Rafique, MNA Talal Chaudhry and PM’s special assistant Asif Kirmani, which had the content indicating the involvement of the establishment and judiciary in conspiracies to send Nawaz Sharif packing, and the prime minister’s directives in this regard. Interestingly, the PML-N hawks have also changed their earlier narrative and now alleged that ‘directors to get Nawaz’ are sitting abroad and the PTI chairman is working for them here. Attempts to get Saad Rafique’s reply to a query whether the ‘foreign directors’ he was talking about possessed the Pakistani passport were not successful. During the 2014 PTI sit-in in Islamabad, the PML-N had accused a former ISI chief of orchestrating the protest to oust Nawaz Sharif. “Since the JIT has submitted its report to the SC, there is no point in showing public strength or reiterating our old stance. There has been a consensus in the party, including [Punjab] Chief Minister Shahbaz Sharif, that PM Sharif will not bow to any pressure to resign no matter how much pressure the opposition manages to exert. The Sharifs will face the case in the apex court and accept its verdict,” the PML-N leader said. The Punjab government believes that there has been “no evidence” of the military establishment or judiciary involved in any kind of conspiracy in the Panama Papers case. “There is no evidence of conspiracy against the Sharif family by any institutions, including the army, in the Panama Papers case. If someone has he must come forward. The JIT is, however, open to scrutiny,” Punjab government spokesman Malik Ahmad Khan told Dawn. When it was alleged that Imran Khan was performing on the ‘script’ written by the directors abroad, he said, it was because Mr Khan was playing outside the boundary of the democratic system. “Political stability is the need of the hour for the progress of the country and when Imran and company try to hamper this progress through sit-ins one thinks about the script writers sitting outside the country who do not want Pakistan to move forward,” Malik Ahmad said. 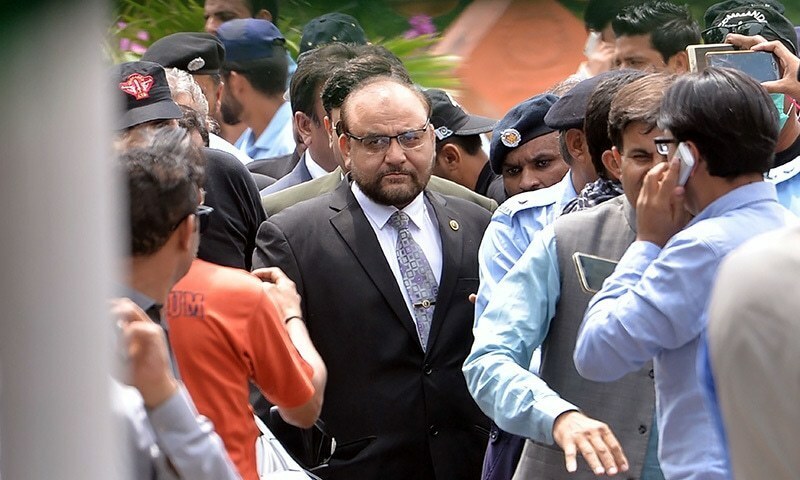 PTI spokesman Fawad Chaudhry rubbished the federal minister’s story of the script writer(s), saying the person the PML-N hawks were referring to was living in Pakistan and working in a construction group. “The PML-N should better find conspirators in Dubai, Qatar and Calbiri font Microsoft. The Sharif family is still living in the 1980s. Since the Sharifs remained part of every conspiracy against the political system, they think the same is happening to them and the establishment is behind it,” he told Dawn. Fawad Chaudhry said in today’s Pakistan it was not possible for anyone to conspire against the democratic system in the presence of vibrant media, strong civil society and independent judiciary. He said the PTI expected a decision in the Panama Papers case next week as the apex court would hear the case regarding declaration of the prime minister’s qualification in the light of the JIT’s findings. “The JIT’s findings are criminal investigation and the Sharif family cannot challenge them in the apex court. The SC may refer the case against the premier and his children to the NAB court where they may contest it,” he added. Is this the end of the Sharif era? Great strategy. Nawaz will be able to save himself no doubt. He is very very experienced. Microsoft, UAE government, British Virgin Islands, IK all conspiring against our beloved PM. I feel you Mr PM. I really do!!! PML-N in panic mode. Desperate attempts to blame someone else, conspiracy theories, propaganda targeted at establishment, judiciary and JIT. They are damaging their credibility even more with those tactics, that will eventually lead to their political demise. Going against JIT is same as going against Supreme Court. This way rule of law can never be established if the workers on institutions working for Pakistan are threatened. Instead of countering the allegations, Mr Nawaz is wasting his precious time in baseless narratives. With every passing day he is fetching himself hate from the public. Salute to JIT for carrying out their duties with honesty & without any fear. Stop conspiring with people PMLN just show the money trail with banking transactions. These very same hawks will be asked to show money trail for their own wealth. This now beginnings of Pakistan. JIT questioned the respondents in very decent manner without any cajole, even many questions were not answered, and investigators pass on to next question. The respondents began criticizing JIT before it even submit the report to SC. The case is subjudice and all stake holders may please wait for completion of judicial process. JIT calling spade a spade is not acceptable..?! PMLN always die in fear of establishment and this invisible sword will be hanging on their neck till their graves. How convenient. Let them do whatever - the game is over for them. PML-N seems to have lost their sense of reasoning as they are making random decisions. JIT is an extension of judiciary as it was working under the direction of SC. Mr Sharif & Co have been caught with substantial evidence against them and so far Sharif's Darbaris have made matters worse by by leading Mr Sharif to a destructive path. Sharifs are digging themselves a deeper grave every single day. It is a serious worry that all senior ministers are directing all their efforts to protect private business issue of family of Nawaz Sharif and not doing their jobs of running the country. So the earlier scramble and maniac verbal attacks on everyone was an impulsive, confused and over-reaction? Now it is more coordinated focus on attacking those who were the main figures in investigating the family? Yeah, says it all about how this party is in panic mode. Tomorrow they will shift their focus on IK again. Their attacks on the credibility of the German newspaper that first dropped the bomb shell didn't work. Stay tuned. I expect next week they will be singing an entirely different song. We must not forget that it was these ministers who distributed sweets when JIT was formed by the court. Now they have turned against the JIT as it did not come under the ministerial pressure. Can we trust these ministers to run our country?? The answer is a simple NO!! Go Nawaz and co, GO! Game set ...and match. N.Sharif has lost it completely. The more they stick to power the more misery and hatred they will get from the public. Sharifs = PMLN, and N is for Nawaz. Nawaz is a corrupt leader and all who supports PMLN is a supporter of corruption. All work on Railways. National Action Plan, Human Development, Debt repayment, trade and foreign affairs must be completed if these ministers are publicly showing all this time to defend the corruption of their leader and his family at the expense of public project governance, time and money. Caught red handed with both hands in cookie jar, still blaming the person who's jar it is i.e. caught red handed from stealing public money and still blaming everyone right left and center. Please NS, have some dignity and ethics (which is hard to find in you and your darbari's) and face the charges and rot in jail..
How about shifting focus to corruption, poverty, development, security, trade and good governance? Who is responsible for the dead children of Tharparker? they are targeting JIT to set an example so no JIT can ever dare to speak truth. Noon is a dirty league. Bash the messenger. Not the message. That's the last desperate strategy for those going down in flames. Musharraf was right with his strategy. These people don't have any sanity and wont ever leave public office unless kicked out with disgrace. I hope people remember picture of NS crying while holding lockup bars. They keep digging deeper, ultimately divine intervention lead to the current impasse - without an external report and IKs drive we wouldn't have arrived to where we are today.. Unfortunately, most ppl still don't understand what the Panama leaks are which shows their lack of literacy in the nation as a whole..well done current & past govts! He has no shame, no dignity, no respect He can literally go down to any level to stick to his seat of PM. And he has proved it after the recent JIT investigations. JIT you are the best. You rock!! We are indebted to you. Cheat, loot, corruption but sure you did do it Mr Nawaz. It's over man end is near! The same way you accepted the JIT report, as promised. There is no shame in these people. Of course we don't want the country to move forward, not at-least in the direction that PML is taking it in !! If that is the case, then Panamagate is also a script and ICIJ must be working under the supervision of the so called foreign powers. Yes, PML leaders are spot on! It's all part of grand alliance by 195 countries just to oust NS, the investigation ofPanamagate scandal and even formation of ICIJ was part of the script. MNS should listen to Nisar, though he will not. I don't know that why people are mad in collection of money which they very well knows that there is no use of this money for them during the period of their life. Even after the death nothing will go along with out of that. There should be some mechanism in the world that if anyone is having money more than the his/her requirements then the same is to be deposited in the govt treasury for the welfare of the nation. No one is above law. Sovereign nations produce honest citizens who protect their motherland. This is a chance for judiciary to take tough action to preserve Pakistan image. On the negative side we are projecting Pakistan as might is right. @Mahmood : They even goes as far as editing the Calibri-Wikipedia page by changing it's introduction from 31 Jan 2007 to Jan 2006. The attempts were made several times and wikipedia has to finally block any modification request. to sum it all, there is no low-point in N-League. what else you can do?? @Shan its not nawaz or pmln, its zardari behind the scenes saving his own bacon, he instructed khursheed shah to sabotage the movement all along and now is kind of become the face of opposition and if you had any doubts listen to what the JIT had to say about rehman malik, he had the proof but didn't play along, because if nawaz falls then zardari falls. @Burhan Thank you for speaking the truth. We are with our Honorable PM Nawaz Sharif. The truth will prevail in the end. @Truth seeker "they are targeting JIT to set an example so no JIT can ever dare to speak truth." Lesson to learn: in Pakistan the only way to cheat is through muscles. But if you have muscles, you don't need to cheat. Now it is proven they cannot cheat, and it's too late to use muscles against JIT. JIT cannot change it's findings now. The muscles will have to be used somewhere else. @Ali PTI supporters hate NS, not the public in general in case PTI considers people outside their part are also Pakistanis like them. PML-N needs to fight back hard and win.